I want you to listen very carefully to my message this month asking the Holy Spirit to open the eyes of your heart. I expect that you do this every time you listen but what I am sharing this month is so basic yet so revolutionary I know that many of you could enter into the rest of God as you listen. I deal with walking in life in the perfect peace and rest of God that is ours in Christ. We have done this before but this time the emphasis is on the how of that, examining the way of trusting in Him. I am excited to share this with you. This coming weekend we are welcoming many students to Module Four of our Bible school. It is thrilling to see so many coming to a solid foundation in the message of His grace. We are rapidly approaching our retreat the second weekend of December at the Inn of the Hills in Kerrville, Texas. If you are still planning to come but have not registered now is the time to do it – we still have some empty seats. Also, we are currently having a sale on our online store at www.MalcolmSmith.org. Through the end of October 2017, many series are 10% off. Some also come with a free CD or with free shipping! Place your order online or by calling our office at (830) 460-4000. 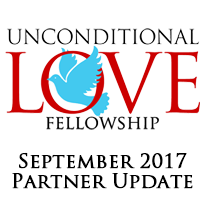 If you have not yet visited our Unconditional Love LLC page on Facebook take a look – there are thousands who are visiting and inhaling those message of grace and love. We also have a group page on Facebook called the “Love in Action Group” and we are adding new members every day. September has been a month of many challenges for all of us. The hurricane was centered just over forty miles from us but the winds spun away from us to Houston. Our prayers have been with all those both in Houston and Florida that have been affected. What many do not realize is that in days of crisis – and so many in September – many persons who would normally donate to this ministry help the hurricane victims instead. September has been a challenging month financially and we ask you to be sensitive to the Spirit if you are led to give extra. Having said that let me celebrate your faithfulness as we approach the end of 2017. Thank you for your gifts you send every month that enable us to continue sharing the life transforming news of the love of God. I say all the time – but it is absolute truth – your giving is not merely dollars to support an organization. Every dollar that you send is the love of God clothed in finances and wrapped in prayer – the gift of your life joined to the Holy Spirit and sent forth to the world. You and I, along with every other partner do more together than either of us could do alone in our wildest dreams. In your monthly giving you are part of my voice carrying God’s love in Christ in the power of the Spirit to the world.